The Scriptapalooza Fellowship program was developed to honor dedicated writers and to help accommodate their creative process and skills. “This new fellowship will give its recipient the opportunity to focus solely on his/her writing by removing the writer from his/her daily commitments and providing a supportive environment,” says Mark Andrushko, founder of Scriptapalooza Screenwriting Competition. The Scriptapalooza Fellowship recipient will be awarded a five-day screenwriting retreat in Costa Rica. The retreat takes place June 10-14, 2016 in Samara, Costa Rica, in a private hotel reserved exclusively for the fellowship recipient and twelve other talented writers. The Scriptapalooza Fellowship recipient will receive six months of mentoring from one of our vastly talented industry mentors. The list includes Janet Jeffries of Lawrence Bender Productions, Amanda Marshall of Cold Iron Pictures, Alexia Melocchi of Little Studio Films, Rob Margolies of Different Duck Films, Katrina Nahikian of Bullet Heart, and Breven Warren of Angaelica. Five additional writers will receive an online writing course, $1000, and a three-month mentorship from one of the above industry professionals. Everyone who applies will receive four to five pages of feedback. Fellowship applications will only be available from Sept. 1, 2015 to Oct 31, 2015. 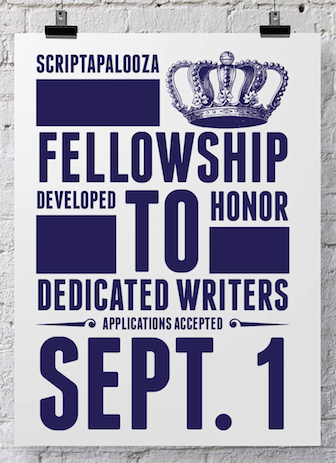 For more information, visit http://www.scriptapalooza.com/fellowship/.